Barbara Glanz, CSP, "The Employee Motivation Expert," works with organizations that want to improve morale, retention and service and with people who want to rediscover the joy in their work and in their lives. She is the author of eleven best-selling "how-to" books. In 1988, Barbara became a contract trainer for The Grammar Group and did a two-day seminar on the English language in Fortune 500 companies around the country. Soon, she was asked to become the Manager of Training, and later Director of Quality in Training, for Kaset International, a Times Mirror company dedicated to enhancing customer service in organizations around the world. While with Kaset, she helped design their facilitator certification process, grew the training staff from 11 to 44, contributed to many of their developing programs and began to speak to large groups at their executive conferences and for client meetings. In 1993 she wrote her first book, The Creative Communicator-399 Ways to Make Your Business Communications Meaningful and Inspiring, and in 1994 she wrote Building Customer Loyalty-How YOU Can Help Keep Customers Returning. 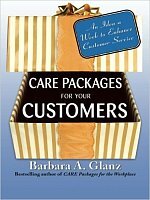 In 1995, Barbara began her own company to help create workplaces where people truly care about one another and the customer and where they are able to fully engage their unique talents in ways that bring joy to them and make a difference in this world. During her first four years in business, she was blessed to speak on five continents and in 50 states through only word of mouth and referral, and she participated in two of Westcott Communication's most successful live satellite TV presentations. In 2002, Handle with CARE-Motivating and Retaining Employees was published, a book based on research with over 1,200 non-management employees, asking them what their supervisor or manager could do to help them do their best work. In May of 2003, she finished Balancing Acts-More Than 250 Guiltfree, Creative ideas to Blend Your Work and Your Life, a book focused on Work/Life balance. In July 2005, she co-authored a book with Ken Blanchard titled The Simple Truths of Service - Inspired By Johnny the Bagger, based on her signature story about a young man with Down Syndrome who completely changed the culture in the grocery store where he was employed. This book has sold over 250,000 copies and has been used by McDonald's to train their managers worldwide! Barbara's book on how to help the friends and family of persons who are grieving, titled What Can I Do? Ideas to Help Those Who Have Experienced Loss, was released in early 2007. When the massacre at Virginia Tech occurred, the publisher sent copies to each family who had lost a child, each church in the area and each school chaplain as their way of offering comfort. Since 1987 Barbara has trained thousands of people in North America and has spoken worldwide to conferences, associations, government organizations and companies both large and small. Some of her clients include: Bank of America, AAA, Honda, Sprint, BlueCross BlueShield, the Social Security Administration, IBM, American Express, AT&T, Southwest Airlines, the American Heart Association, Nationwide Insurance, Chick-fil-A, Hilton Hotels, Kroger Company, Allstate Insurance, Boeing, Delta Airlines, the Pampered Chef, Toyota, and the US Department of Energy. In January of 2007, Barbara Glanz became the first speaker on record to have spoken on all seven continents and in all 50 states. She has earned the highest designation the National Speakers Association awards (Certified Speaking Professional), has been selected as a Platinum Speaker by Meeting Professionals International and has been nominated five times for the NSA Speaker Hall of Fame. Since 1997, she has been one of the top-rated speakers at the National Society for Human Resource Management convention, and in 2006 she was the only female in the top ten rated speakers. She has appeared on ABC, NBC, CBS, CNN, FOX-TV, WGN, CNBC and on radio and in print nationwide. In July of 2010, Barbara was voted "best keynote presenter you have heard or used" by Meeting & Conventions Magazine. The following month, she was selected as a "Legend of the Speaking Profession" by Veteran Speakers. She is a member of the National Speakers Association, NSA Central Florida, NSA New England, the Society for Human Resource Management, the American Society for Training and Development, the National Association of Female Executives, Kappa Delta Pi, Gamma Phi Beta and is included in Who's Who of American Women, Who's Who in the Midwest and Who's Who in Entertainment. Barbara has three additional "claims to fame": her great-grandfather laid the cornerstone where the four states come together (Page, Arizona, is named after him), she played the piano on the TV show "Talent Sprouts" and she directed David Hasselhoff of Knight Rider and Baywatch fame in his first high school play! Sixty-five percent of American workers said they received NO appreciation all last year for the good work they had done. Yet the second most important thing people want from their jobs is full appreciation. Why is there a disconnect? Because most of us are just too busy! In this delightful and inspiring session Barbara will share ten simple truths about appreciating others which you can immediately apply both in your work and your personal lives. The beauty of appreciation is that we can each give it to anyone we choose for no cost except our awareness and a few moments of our time. This session is based on an unforgettable story about a young man with Down Syndrome who changes the culture of a grocery store by being creative and giving customers more than they expect. This session, based on the exciting new book by Ken Blanchard and Barbara Glanz, shares ten simple truths of service that will help organizations to reshape their culture around serving the customer. It will grab your heart and get your creative juices flowing on ways to create "customer enthusiasm" in your organization. Considering that the average cost of replacing an employee is $50,000 today, it is vitally important for supervisors and managers to understand what their employees really want, and the good news is that it is not all about money. This presentation will directly impact your bottom line as well as to help create workplaces where people feel valued, respected, and appreciated for the work they do. Raise morale, reduce turnover, increase productivity, and have more fun at work - the wonderful news is that all this can occur in your workplace with very little cost. In this presentation you will learn how to create a work environment where people treat one another like valuable human beings with a sense of mission that their work is important and where appreciation and joy are present, no matter how serious the work may be. Building Customer Loyalty : How YOU Can Help Keep Customers Returning! After years of working in customer service, Barbara has come to believe that you cannot mandate customer service. It must come for the inside out. Using both internal and external customer loyalty research and dozens of no-cost, immediately implementable action ideas, Barbara will inspire employees and managers alike to CHOOSE to make a difference in all customer interactions. In this presentation Barbara tells us to FORGET BALANCE because we will never be in balance but instead to take the energy we spend on feeling guilty and use it to creatively blend the other areas of our lives - Family, Friends, Health, Spirit and Service - into our Work. Barbara will share dozens of creative, immediately applicable, no-cost or low cost ideas to help this blending happen, making this presentation a great experience for both employees and employers. These programs can be designed for business organizations, spouse programs, or women's groups. Exhausted, Confused and Ticked Off : Hope for a New Beginning When Change Has Done You In! Change is rampant in our world today, both in our personal and our professional lives. We are all bombarded with change, and it is clear that what happens at work impacts our personal lives, and what happens in our personal lives affects the way we perform at work. In order for people to move forward both in their professional and personal lives, they must learn to let go of the old ways and adjust to new ways of work and life. This inspiring, interactive presentation will help you find greater job satisfaction and more personal happiness by enabling you to better understand the change process as well as your feelings in the midst of change. Using dozens of real-life examples and easily implementable action ideas in such areas as rewards and recognition, day-to-day appreciation, enhancements and reminders, recoveries, measurements, and personal executive actions, Barbara will reawaken the creative spirit in your organization and help both employees and managers find more positive, meaningful ways to communicate whether it is written, electronic, or face-to-face communication.